In Books Tagged In First Nations, Historical Fiction, Mohawks, New France, Radisson, and YA Novel. 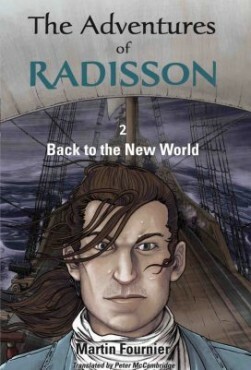 After spending two years with his new Iroquois family as described in Volume 1, Pierre-Esprit Radisson escapes and sails across the Atlantic to Holland before boarding ship to head down the west coast of France. Using his wits and the skills picked up in the New World, he makes his way up the Loire and arrives in Paris hoping to find his mother. But war for the succession of the king of France has razed the faubourg where he had lived with his family. What has happened to his mother? Obsessed with returning to New France and the way of life he now loves, Radisson agrees to sign on with the Jesuits who are intent on evangelizing the New World. His return to the St. Lawrence Valley also means assuming responsibility for his past—his capture by the Iroquois and the death of his friends—but also honouring his commitment to the Jesuits and living a less adventurous life… at least temporarily. But the New World is rife with challenge and conflict as cultures and economies collide. His mastery of the Mohawk language and knowledge of Mohawk culture make him a much-needed strategist and diplomat as plans are hatched to establish a new mission in the heart of Iroquois territory, which until recently was home to New France’s mortal enemy. “Fournier is recognized as a specialist on this historic figure whom he has brought to life in his three young adult novels… The author skilfully blends action with information about the Eastern woodland natives’ way of life, including their political arrangements… Fournier presents both the Iroquois and the French points of view fairly. The characters are well drawn… Highly Recommended.” Ruth Latta, Canadian Review of Materials, University of Manitoba. Martin Fournier is a historian and writer who has specialised on Pierre-Esprit Radisson and the adventure of New France. He is also an impassioned storyteller whose work has earned the Governor General’s Award for young people’s literature. He lives in Quebec City. Peter McCambridge is an award-winning professional translator based in Quebec City. He holds an MA in Modern Languages from Cambridge University. He also translated I Hate Hockey (François Barcelo), The History of Montréal (Paul-André Linteau) and Volume 1 of the The Adventures of Radisson, Hell Never Burns. Peter won the 2012 prestigious John Dryden Translation Prize awarded by the British Comparative Literature Association.